Colorful pants are a fun way to add a pop of color to your outfit. Winter clothing can be so dreary and monochromatic. That is why I love these pants. Blue jeans are so typical but royal blue wide-leg pants are not. They are a bit unexpected and completely chic. Due to the cold and gloomy weather this time of year I decided to wear fleece lined leggings underneath my pants. The luxurious silky fabric would feel great on my skin in Summer but Winter is all about layers! One of my all time favorite layering tools for cold weather is my black faux fur vest. We met by fate! I found it in a box of clothing from a storage unit that I bought one day. It still had the tags on (along with most of the clothes) and I instantly fell in love with it! I think I love it even more because it is a size large. Lately, I like my style to have a lot of texture and dimension. This over-sized vest adds both. I love that pointy shoes are making a come back. I think there is something so elegant about this style. The pointy toe pump is a classic. These black velvet pumps have patent trim and a bow. Totally sophisticated and totally cute! 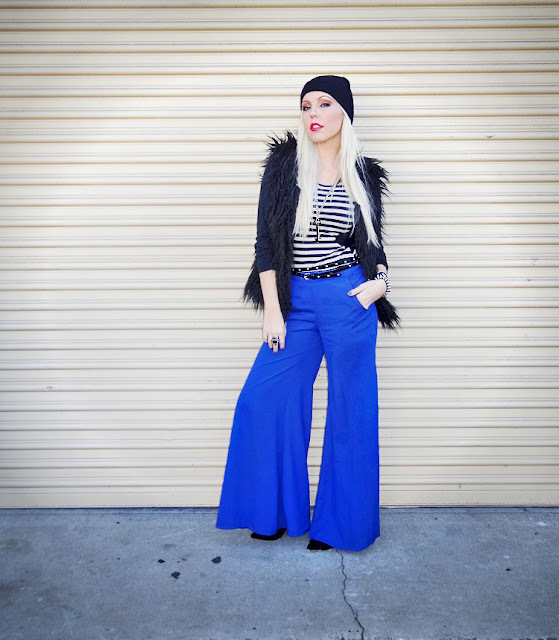 These bold blue pants may seem hard to pull off but in fact they are quite flattering and versatile. 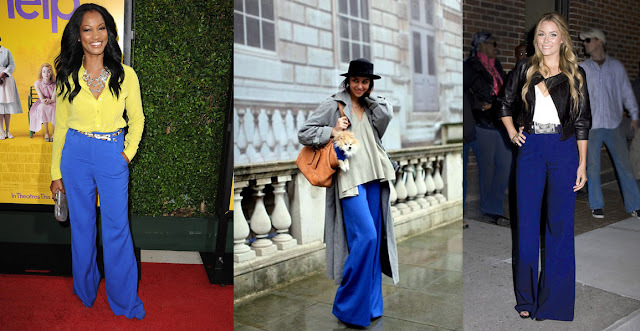 Here are some celebs rockin Wide-Leg Blue Pants as well. Faux Fur Vest- I have seen similar style vests on ebay. As a fan of your appearances on AMIClubwear's YouTube channel, I am glad to be here and to Follow this blog. It is my first time commenting here. Not only do I love palazzo pants, and not only do I love blue; I love these blue palazzo pants along with the pumps. A good pair of palazzo pants can be as appealing as a maxi skirt, and a good palazzo jumpsuit can be as appealing as a maxi dress. This is incredible style shown by you here. Much love.